From ancient times, all the way up until the present, music as an art has always played an important role in our society. Each and every one of us peps up their leisure -or not- time with a bit of music. 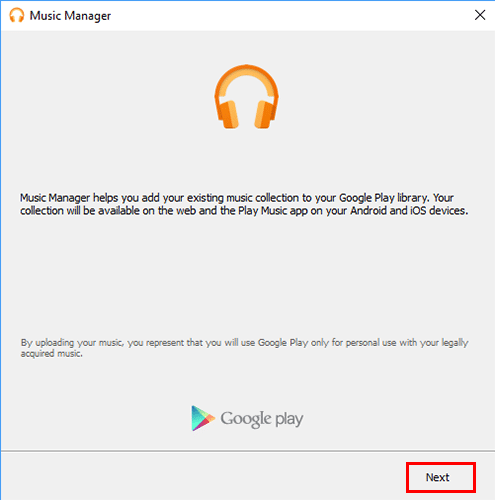 In this guide, we will thoroughly examine the free and premium editions of Google Play Music, one of the Google Play services, and find out how to organize our music in the most efficient way. Are you interested in Music Locker services? 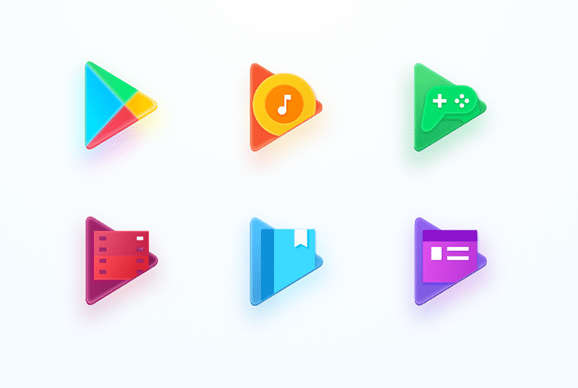 On Google Play, one may find applications, games, movies and TV shows, music, digital books, premium news services and publications. 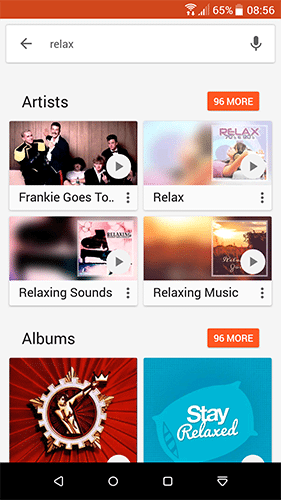 "Music Locker" is the name that has prevailed over the past few years for services such as Google Play Music. 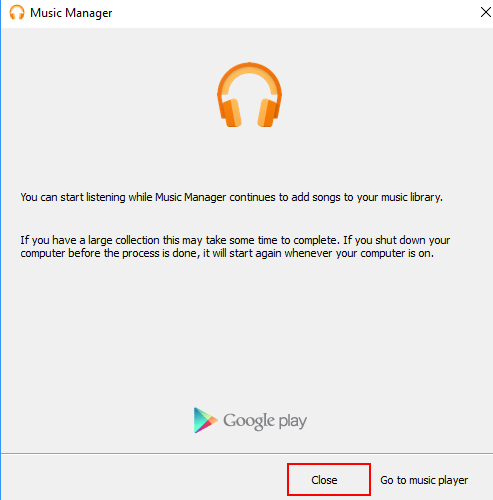 This means that Google Play Music is not just a music player application. It is, in fact, so much more. A Music Locker service offers us online storage for our music, as well as incorporated tools to manage it fast and easy. But what really sets such a service apart is the fact that it grants a user access to big libraries through audio streaming. A Music Locker user has the opportunity to audio stream among tens of millions of songs, without having to have them stored on their device. 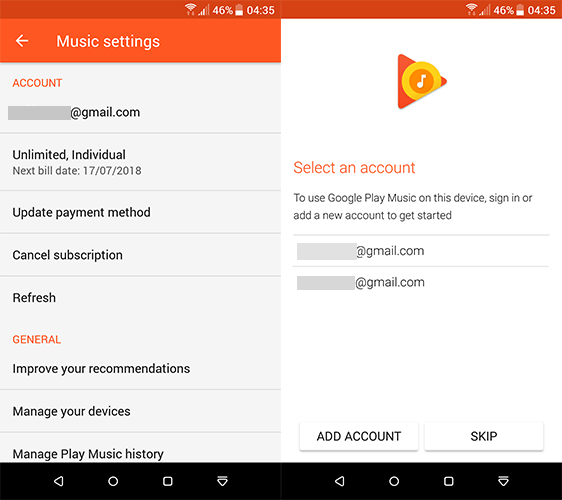 Google Play Music is available in two editions: Free Edition and Premium Edition. 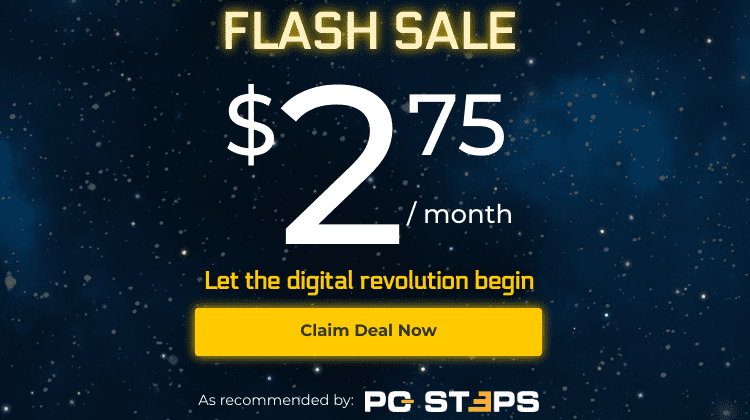 The subscription for the premium edition comes up to around 8 dollars per month. 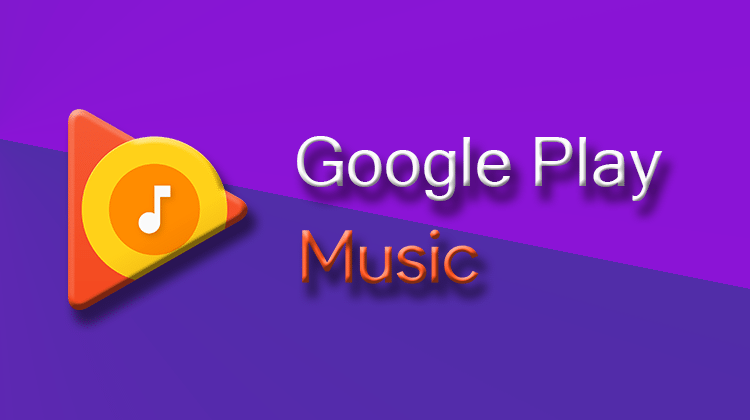 Google gives us the opportunity to try Google Play Music free for 30 days. We can subscribe to the premium edition of the service either through the smartphone app or through the service website. The procedure we follow is the same in both cases. 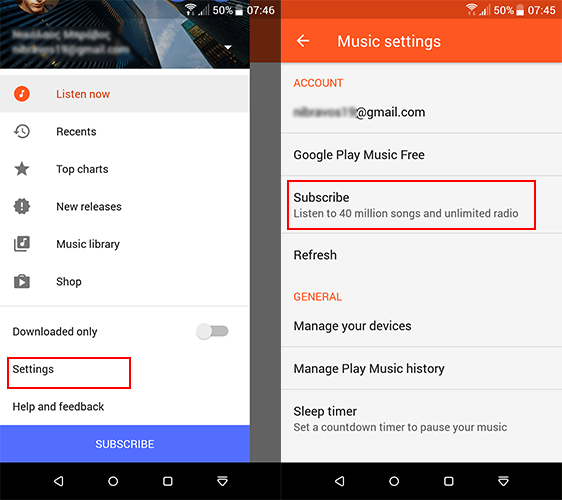 In order to try the premium edition, first, we open the Google Play Music app on our smartphone. Then, we go to the main menu, which is seen at the top left part of our screen, as in the picture below. ...next, we select "Subscribe," to also claim the free trial period, and then "Continue." The next step is to link to a means of payment. 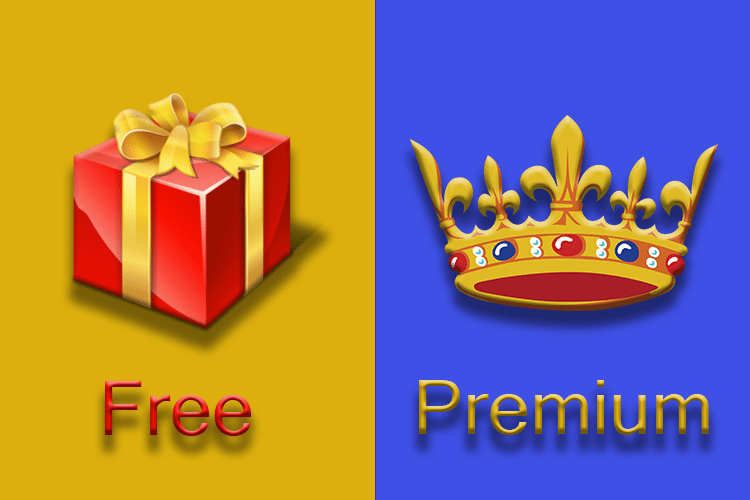 Note that we will not be at all charged for using the premium service during the free trial. However, we will be charged normally for purchases of songs or albums. In order to subscribe through our computer, first, we go to the service website. If we have not yet used up the free trial, the system will automatically recommend that we subscribe. While subscribing on the webpage of the service, we will be asked to select the genres of music we are interested in, as well as our favorite artists. After signing up properly, we have to make sure to cancel our subscription from the service before the free trial is over. Otherwise, once the 30 days have passed, we will be charged the monthly subscription fee. 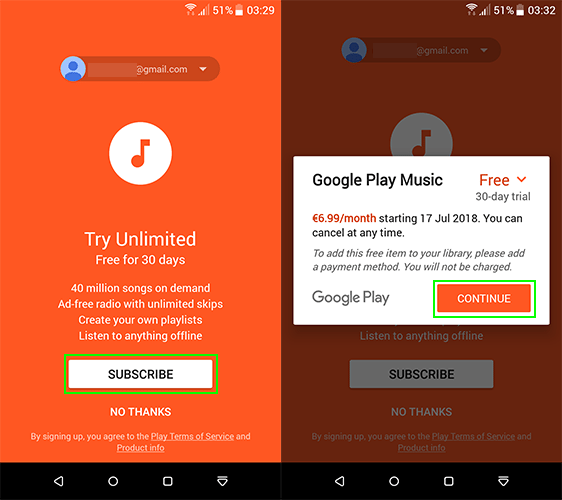 After we have canceled our subscription, we will continue to have normal access to all Google Play Music services, until the expiration of the trial version. 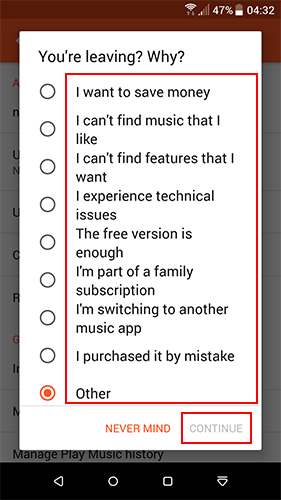 In order to cancel our subscription using the smartphone app, we open the Google Play Music app, and go to "Settings." 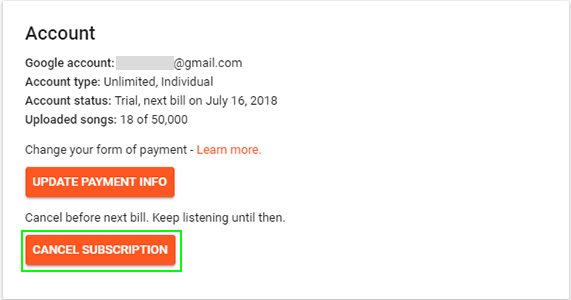 Then, below "Account," we select "Cancel subscription." After selecting a reason, we tap "Continue." It doesn't matter which reason we picked, our answer will be stored for Google's statistics. We will be taken to our subscriptions. 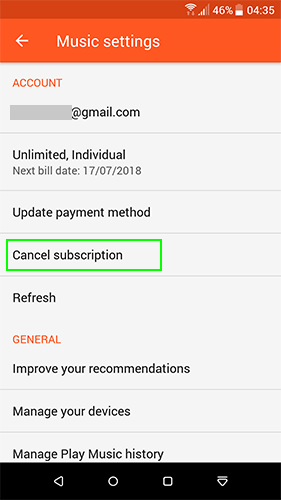 On 'Manage subscription' we hit "Cancel Subscription" and confirm it. In case the trial period is over and we have not canceled our subscription, we will be charged the monthly subscription rate. In order to cancel our free subscription through our computer, the procedure is similar. We go to the website of the service, then to the main menu and finally to "Settings." Moving on, we select "Account," and click on "Cancel Subscription." We choose a reason why we are leaving and we click on ''continue." We will be taken to our subscriptions page. 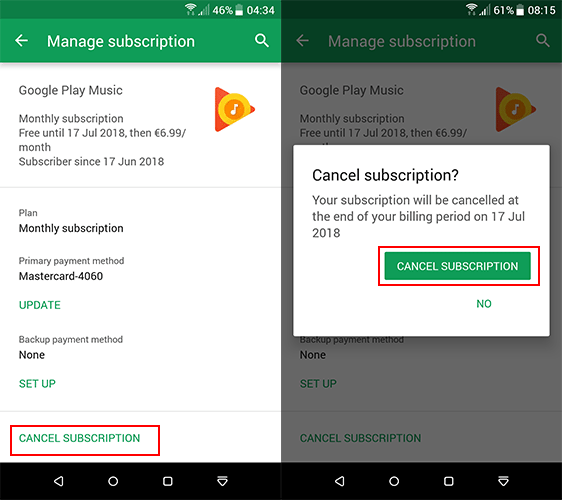 Next, to the Google Play Music app, we click on "Manage" and then"Cancel subscription." Finally, we confirm the cancelation. When our subscription is canceled, we will be notified with a respective message on the same window. We should click "OK" to finish the process. 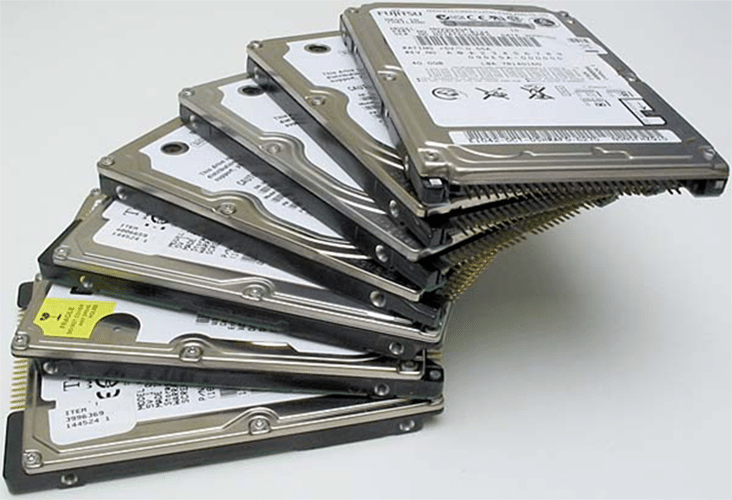 One of the main questions about online storage services is the actual storage size. 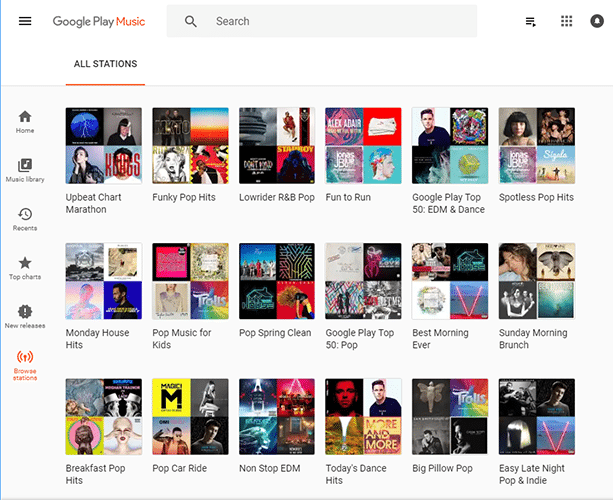 Google Play Music gives us the opportunity to store up to 50,000 music tracks online. This way, we will have access to our whole music collection without having to store it on our smartphone. 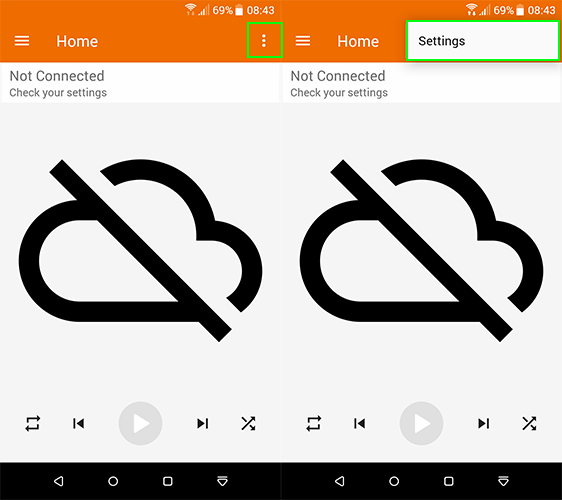 We can also create our own playlists and download our favorite ones, in order to access them while offline, too. 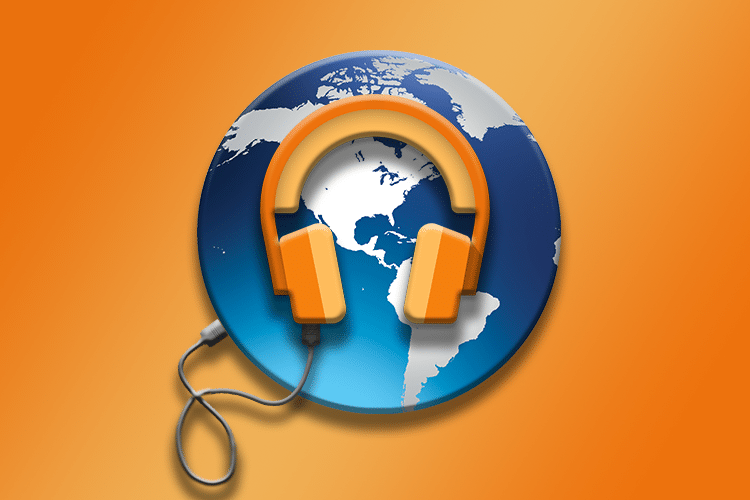 The main feature of the premium edition of the application is the audio streaming. 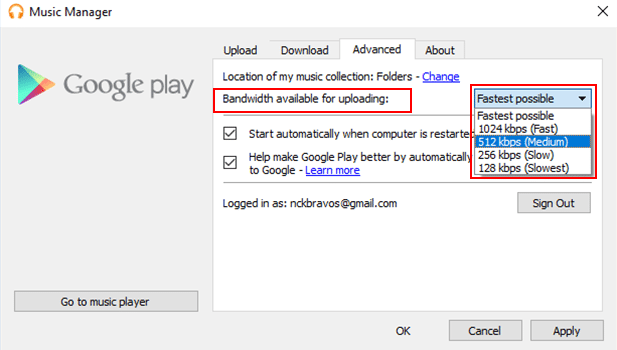 Google Play Music provides us with high-quality audio streaming with quality of up to 320kbps. Of course, in comparison with other premium services, it is not the highest possible; still, it remains more than satisfactory. 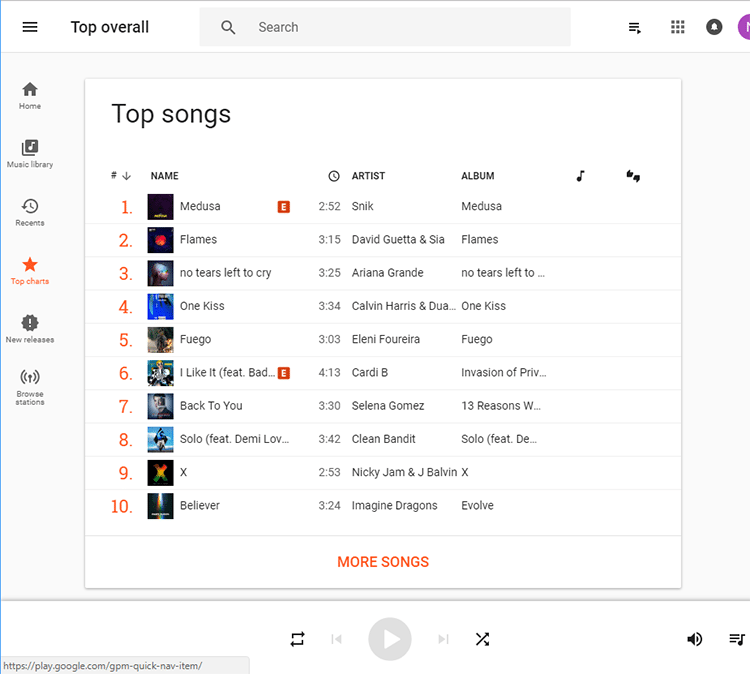 The music collection of Google Play Music is one of its strong assets, as it contains more than 40 million musical pieces. All this music is available to a subscriber for audio streaming or for offline listening. 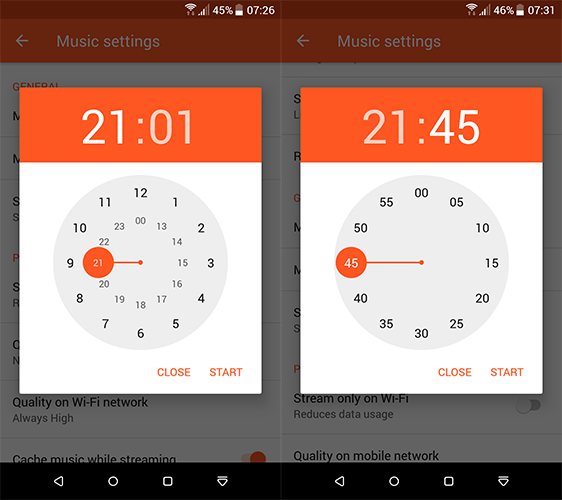 One more advantage of the premium edition is the opportunity to listen to the radio with unlimited track skipping. We can choose to listen to customized musical programs through a huge collection of radio stations. We can even see and listen to the top music tracks and albums at that particular moment. 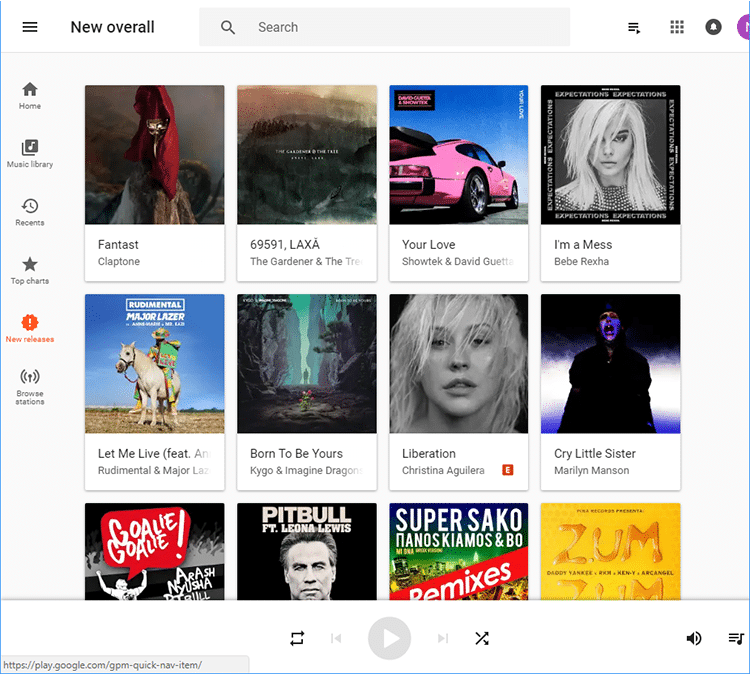 For those who want to keep up with the latest music news, Google Play Music gives us the opportunity to see and listen to new releases. A useful tool to upload and manage our music is the "Music Manager." We can download the application for our desktop computer or our laptop here. 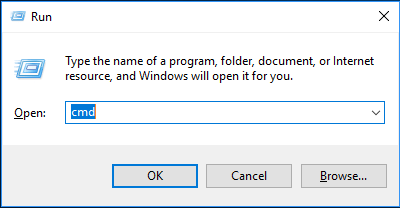 For the setup, we simply double-click on the executable file. On the window that appears, we click on "Next,"
We are given 4 options. 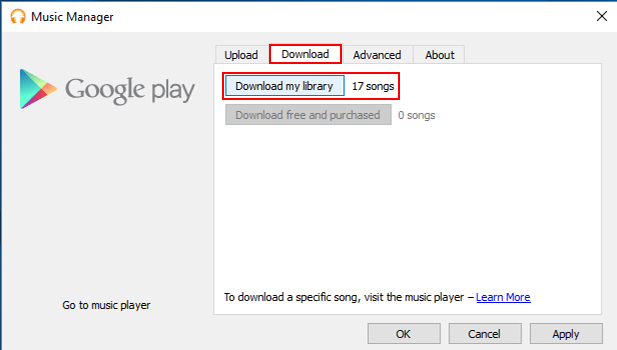 We can transfer music from Windows Media Player, from the folder "My music," or from other folders where we store our music. The two next snapshots of the setup are informative. 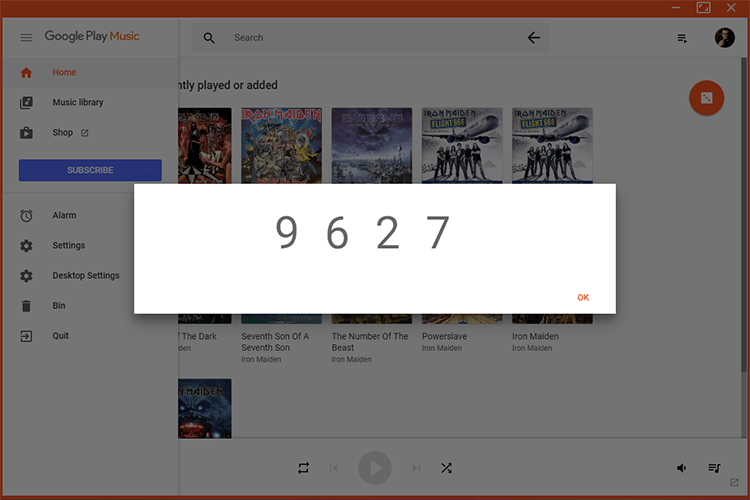 The first, informs us about the total number of songs we can upload on Google Play Music. We click on "Next." In order to complete the setup, on the final window, we click on "Close." 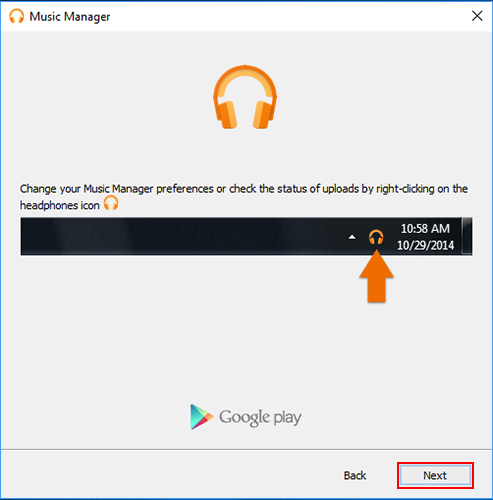 The Music Manager will not close, but it will be minimized on our taskbar. After the setup is complete, we can access the Music Manager by double-clicking on the headphones icon on the right side of the taskbar. 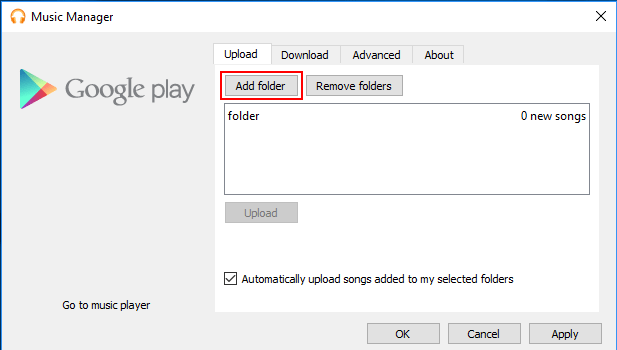 From that point on, we can select to upload the songs that we have saved locally on our computer. To add one or more folders, we select "Add Folder," and then the folder we want to add. 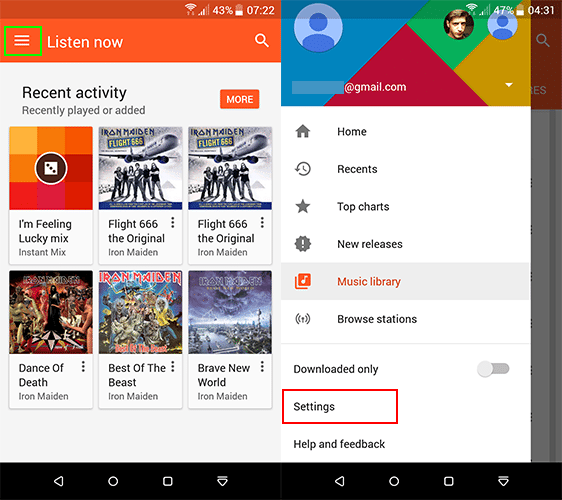 We are given the choice to synchronize our selected folders with Google Play Music. 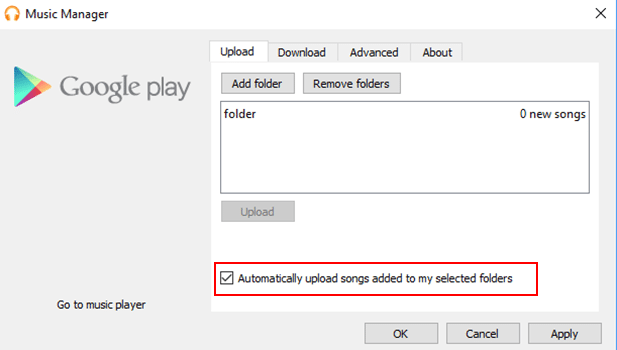 This saves us time from having to refresh our music collection every time we add a new track to it. 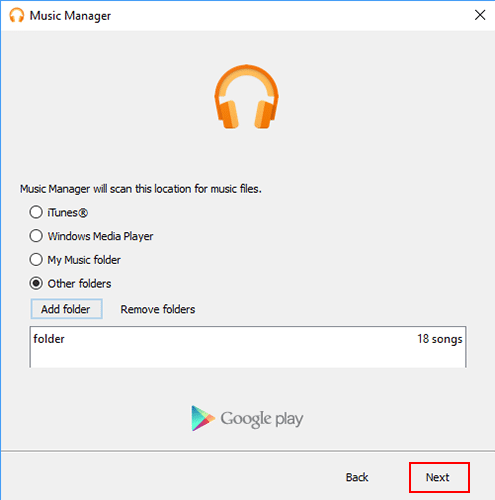 In order to synchronize the folders with our music, we just need to tick the box of the Music Manager window, as shown in this picture. After we have finished with the selection of our music, we let the Music Manager take over until the uploading of our tracks is complete. Depending on our music collection, this may take up from a few minutes to a few hours or even a few days. 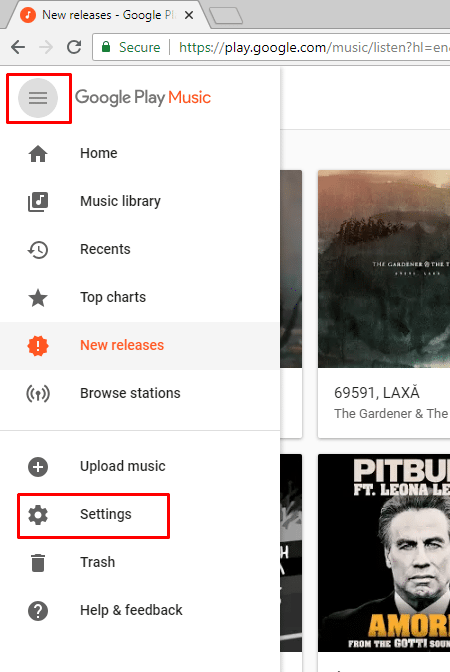 Once our songs are uploaded, they will be accessible by any device, as long as we sign in to our Google Play Music account. 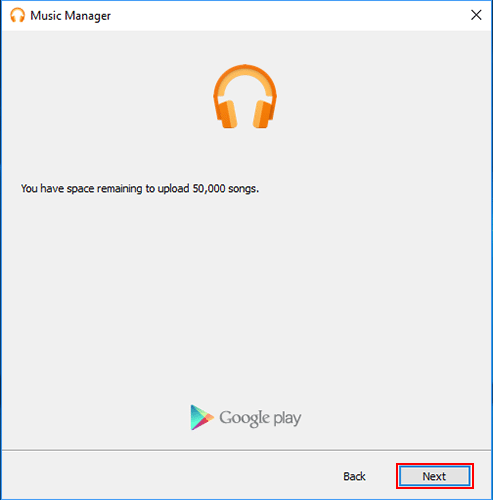 At this point, we should note that we can download our whole music library on the Music Manager to our computer. All we have to do is go to "Download" and select "Download my library." Finally, in case that our music library is too big and we need our network bandwidth, we can restrict the uploading track speed until the uploading is complete. In order to do this, we go to the "Advanced" tab and we restrict our bandwidth use according to our needs. 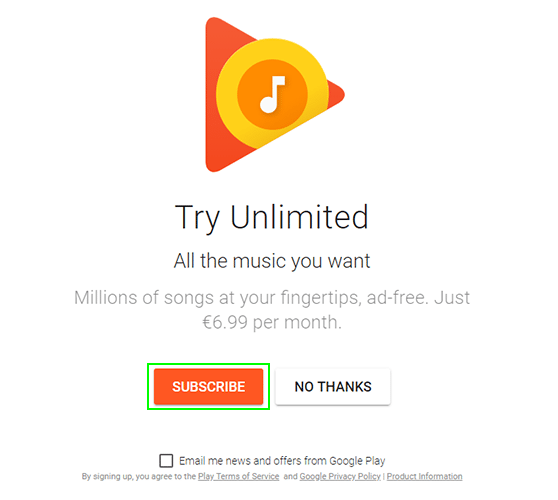 Google offers us a special Chrome extension, apart from the official Google Play Music page. We can download the Chrome extension here. 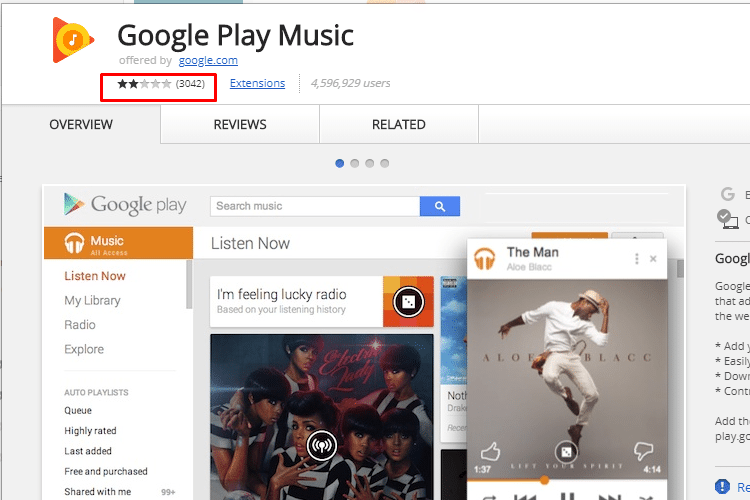 However, the use of the official Google Play Music extension did not seem to get a great rating. Obviously, it will not offer us as much as the official website does. The extension is a new window, and for this reason, we need to always have it on in the foreground or else change the window in order to use it, which means it might become slightly annoying to use. 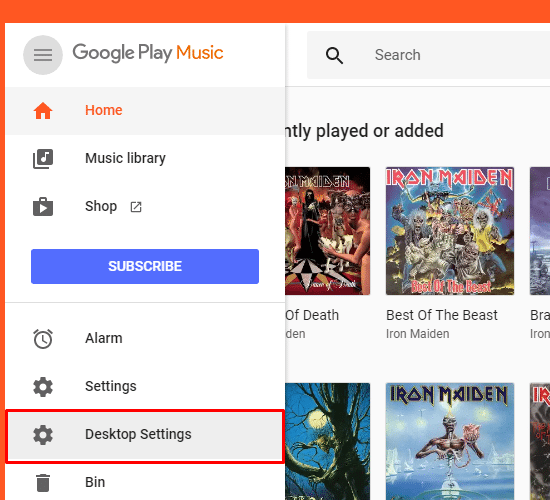 To compensate for the little imperfections of the official Google Play Music extension, 'Desktop player' is here, this time not from Google, however. The app is available here, from Github. 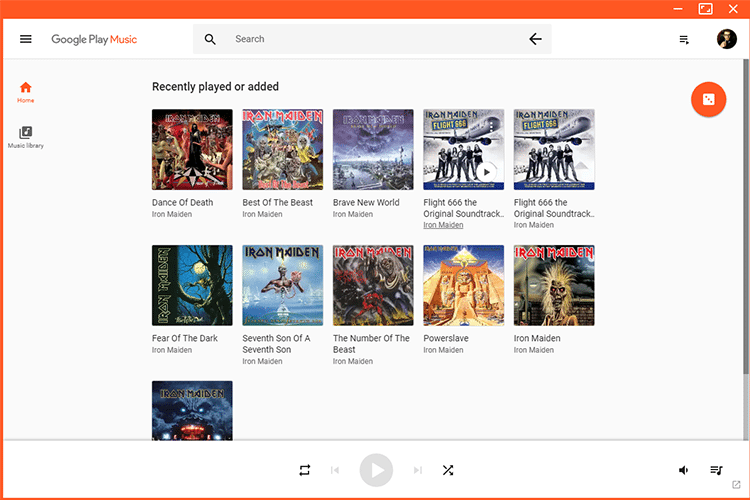 It has the classic Google Play Music orange and white theme, as well as all the functions of the online player of the service. Let's also note that the application is compatible not just with Windows and Mac, but also Linux. The difference is that it is not necessary for us to have the service page open. We can just open the player, minimize it, and carry on listening to our music undisturbed. We will find the respective icon on the taskbar grid at the bottom right part of the screen, in case we want to access the Desktop Player. A boon of this project is that there is a respective smartphone app, which is used as a remote controller for the player. Then we check the box "Enable Playback API." 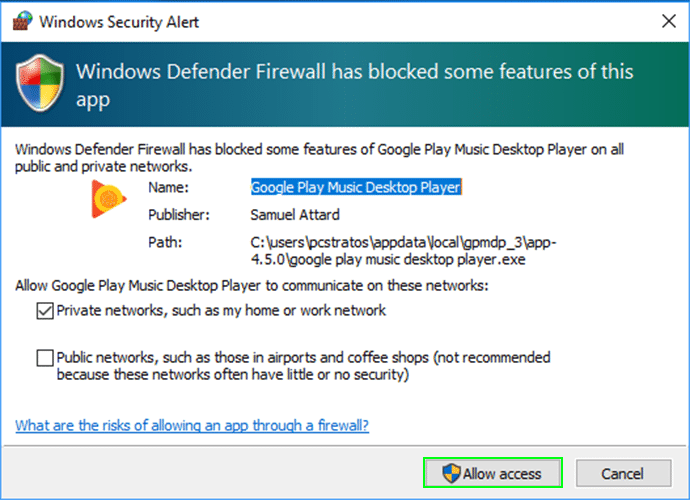 At this point, we should mention that sometimes the firewall obstructs the activation of the selected options. 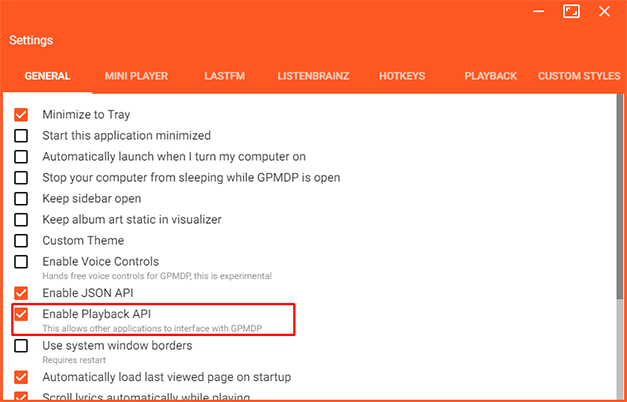 However, if the firewall notification does not come up, with a restart of the player, we will be asked automatically if we want to activate the API. 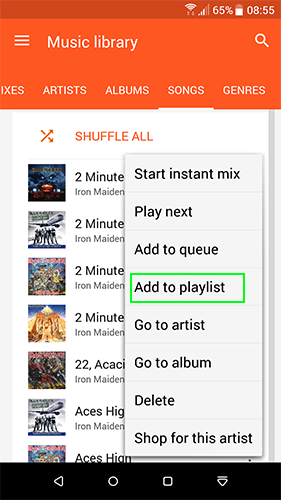 After enabling the selection, we open the Google Play Music app on the device we want to use as a remote controller for the player. Next, we access the settings from the top right part of our screen. 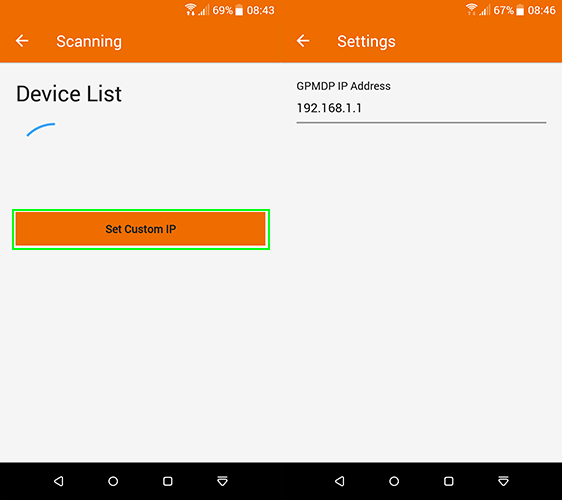 The next step is to click on "Set custom IP" and we can import the internal IP address of our computer. 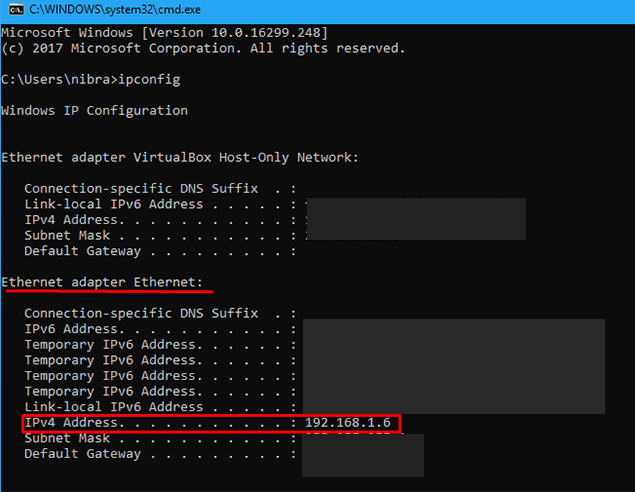 In case we don't know the internal IP address of our computer, we can easily find it with the following procedure. 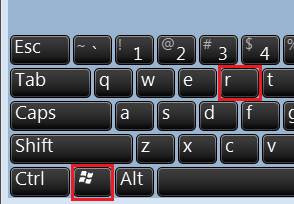 First, we press the key combination 'Win + R' on our keyboard. In the emerging window, we type "cmd" in order to open the Windows command line, and then "OK."
Then, on the command line interface, we type the command "ipconfig," and we press "Enter." In the results, we search for the means that we are connected to the Intenet with. The internal addresses usually have the form "192.168.X.X". We can find our own next to the address "IPv4Address". After the Desktop Player recognizes our device, a password will appear. We will use this password on our phone app in order to verify our device pairing. 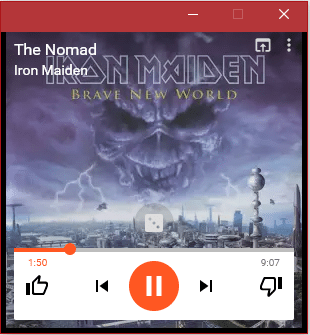 After we enter the password on the phone, we can manage certain Desktop Player functions. 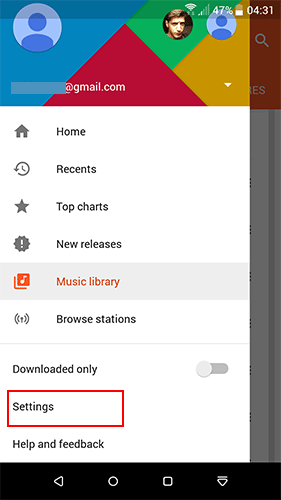 The Google Play Music app for smartphones comes pre-installed on every Android device. 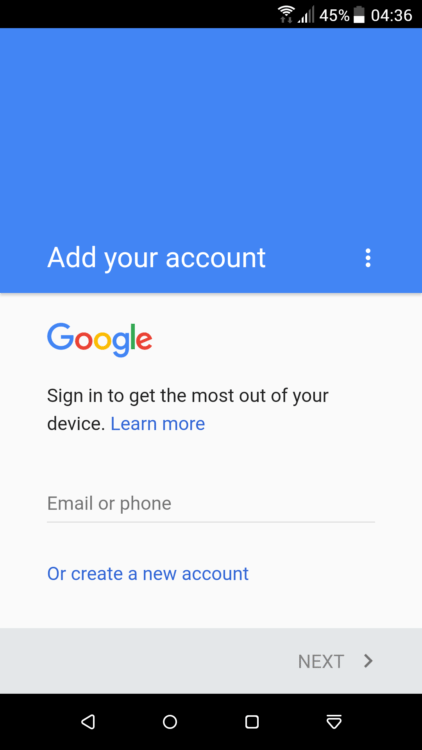 We can have access to our music library and all it takes is to sign in to our Google account. 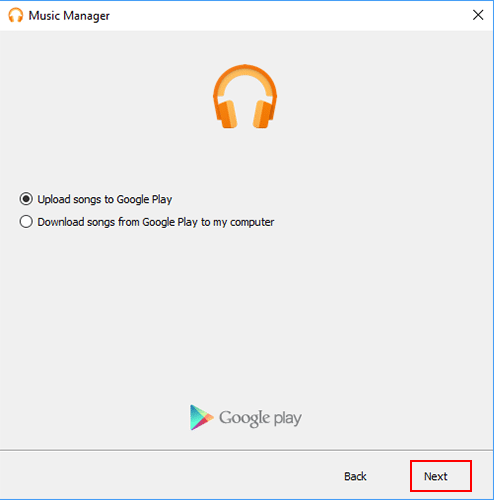 To sign in to our account, we just tap on the Google Play Music icon. We go to the main menu on the top left of our screen, and from there we enter "Settings." On "Account," we can see the account that we have signed up with. In order to add or change an account, we only need to tap on the email (first option), and then "Add account." and we have access to our music. We need to be careful because our music is not stored on our smartphone. 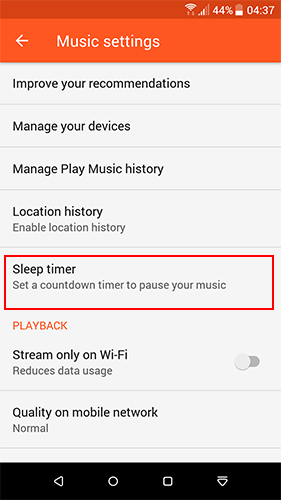 To listen to a music track offline, we need to download it to our device first. 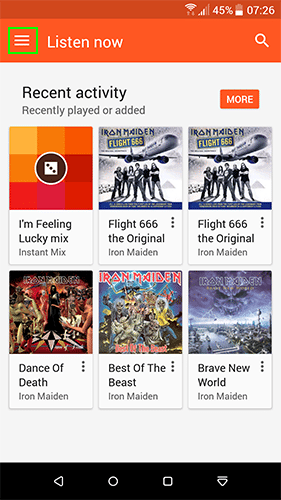 Google Play Music is an easy way to keep our music libraries organized. 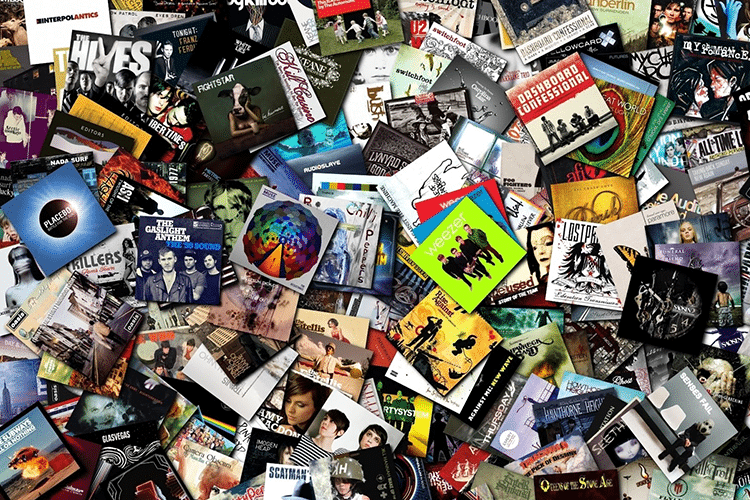 It offers us easy access to the tracks we want, and we can search and listen by artist, album, song, and genre. We have the opportunity to create our own playlists. To do that, we select the song we want to add, and we tap on the 3 vertical dots next to its title. Then, on the drop-down menu, we select "Add to Playlist." 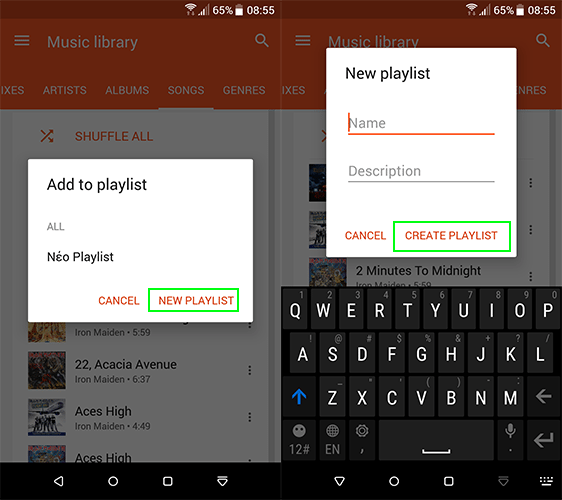 There, we can select an existing playlist to add it to, or we can create a new one. 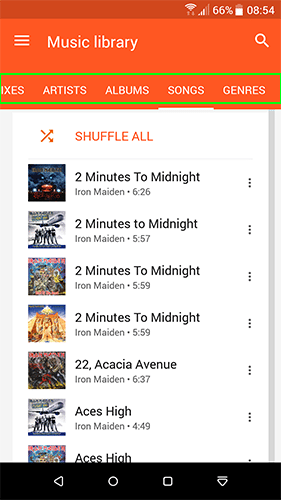 Google Play Music Radio is a good way to listen to new music. It features programs for every taste. 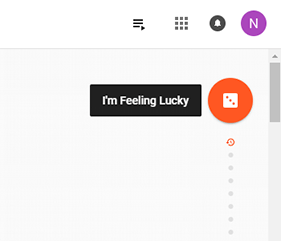 Also, there is the option "I feel lucky," which plays tracks based on our personal preferences. In the 'browse stations' section, we can find all the radio stations gathered together. 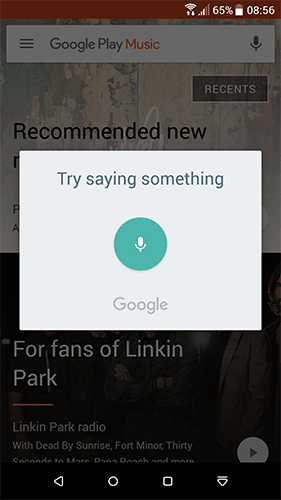 For those of us who are neither willing to scroll down nor type on the station search box, luckily there is voice search. We can search for music tracks with just one word, and we can search for artists or music pieces just by pronouncing their name. 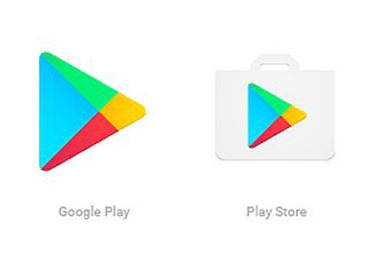 On the right side of the Google Play Music search bar, we will find the microphone icon. 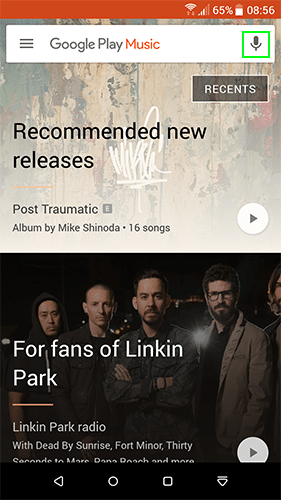 ...we say the phrase we want, and Google Play Music performs the search for us. Let's note that we can search even by using keywords or key phrases, such as "gym" or "night out." we scroll down to and select "Sleep timer." There, we set the timer, which will pause the track once the time limit we have set has passed. This way, in the morning, your smartphone battery won't be empty, and you will have slept well. Do you use Google Play Music or another Music Locker? In case you are not using a Music Locker, would you now consider doing so after reading this article? Or will you keep using simple, conventional music players? We are looking forward to your answers in the comments below. 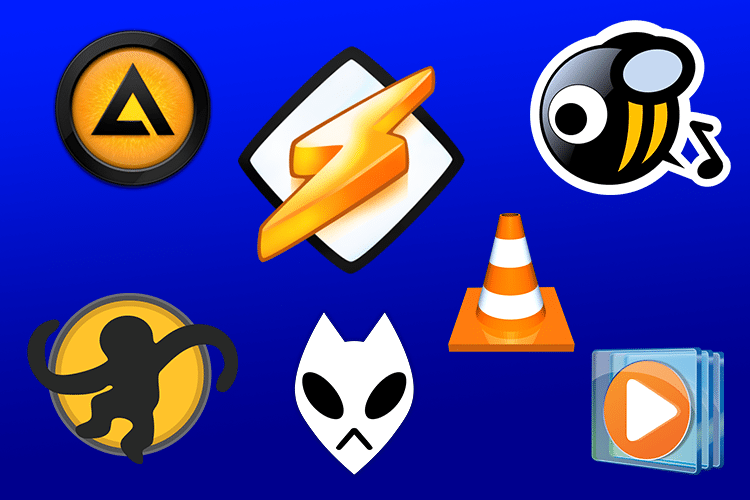 Previous Post: « Riddle Me This: Which Are The Best Free Online Riddle Games?